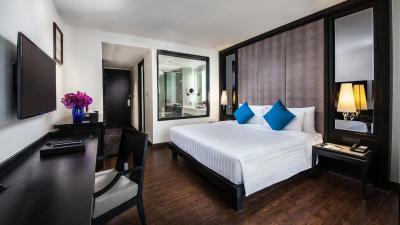 Lock in a great price for Mövenpick Hotel Sukhumvit 15 Bangkok – rated 8.4 by recent guests! They have tuk tuk that takes you to and from terminal 21 mall.. and it’s 24/7.. the room is big enough, the shower is nice and they have smoking rooms only on second floor.. I didn’t try the food but I ordered cappuccino and it was really good.. the staff are friendly and helpful.. quick check in/out process..
Beautiful building and environment, comfortable bed, and great services from all staffs. 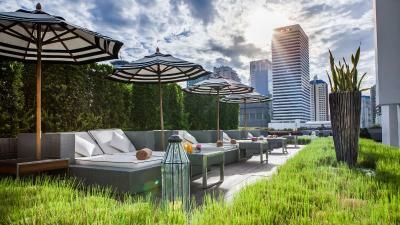 What I like the most is the amazing rooftop pool and bar. The hotel provides free. Tuktuk service going to Terminal 21 mall. Very nice staff. 711 store beside the.hotel. Spas, streetfood.located eveywhere. Thank you for allowing me to have an early check in. I arrived early prior to the check in time but they advised.me to wait for an hour and they will give me a room. The location was perfect. 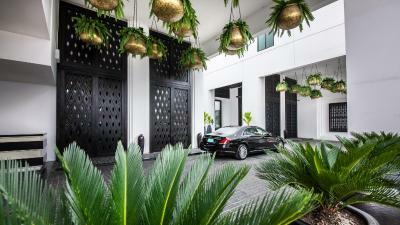 The hotel is providing free tuktuk service from the hotel to Terminal 21 mall. The place is near spas restaurant, streetfood is available. Very clean. Breakfast was good. Good choice of breakfast food. Free Tuk-Tuk transport. Good location. It was a perfect location for us. We were attending an event in NIST so we were able to walk there. Also very close to a train station and mall. Nice hotel, room and staff. hotel has shuttle to Terminal 21 every 15min. Its very easy to go around. Staff very attentive and caring especially towards my two young children. 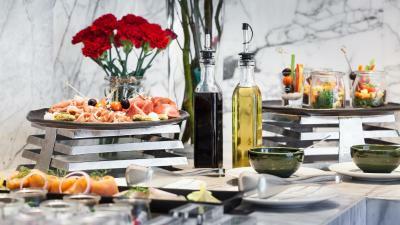 Breakfast is excellent, rooms very well appointed and spacious. The hotel has a real luxurious feel. First, I would like to thank everyone working at this hotel. The best staff, clean room, bathroom, free metro drop, food is amazing, value is super. 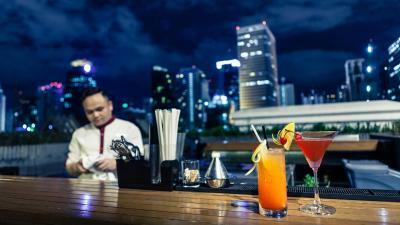 I recommend 100% and all my and friends stays in bagkok will be on Movenpick if you can keep this level and prices. 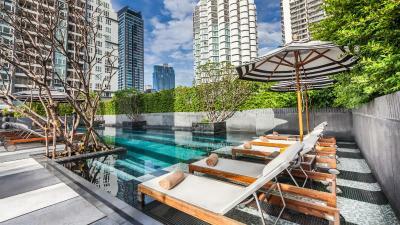 Mövenpick Hotel Sukhumvit 15 Bangkok This rating is a reflection of how the property compares to the industry standard when it comes to price, facilities and services available. It's based on a self-evaluation by the property. Use this rating to help choose your stay! 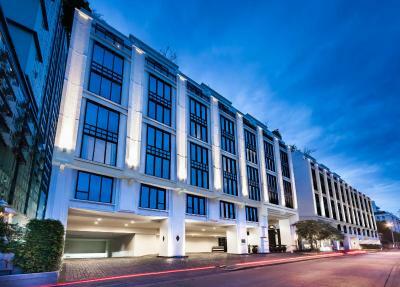 One of our top picks in Bangkok.Mövenpick Hotel Sukhumvit 15 Bangkok is conveniently located in Sukhumvit, within easy reach of various businesses and shopping centers like Terminal 21 and EmQuartier Shopping Mall. 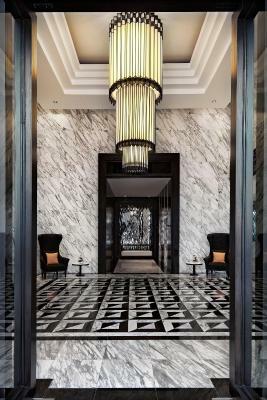 Set only a 5-minute walk from BTS Skytrain Station and MRT Subway, this hotel also offers a free round-the-clock Tuk Tuk shuttle service. 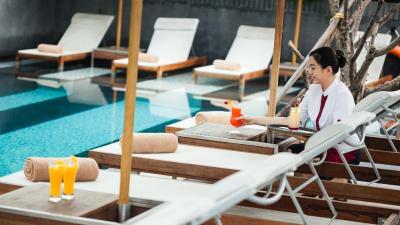 Guests can enjoy at a rooftop bar, a 100 feet lap swimming pool and free WiFi. 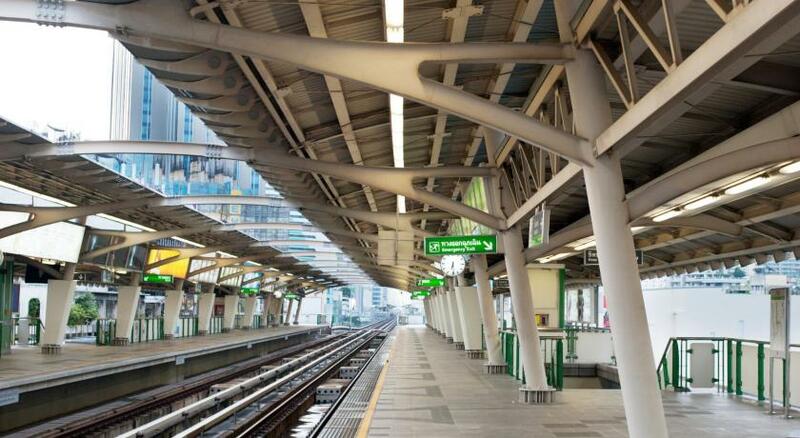 Suvarnabhumi International Airport is approximately a 35-minute drive away. All stylish modern rooms and suites are air-conditioned and provide an LED flat-screen TV, a large working desk and a mini-bar. An in-room safe is also available for added security. Complete with a bathtub or a walk-in shower, the private bathroom comes with bathrobes, slippers and a hairdryer. 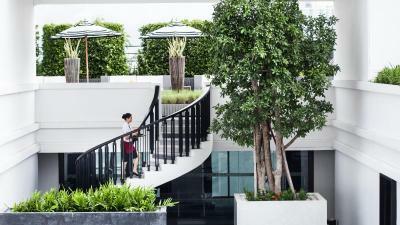 A stay at Mövenpick Bangkok Sukhumvit can include a work out at the fitness center or guests may contact the 24-hour reception for concierge services. 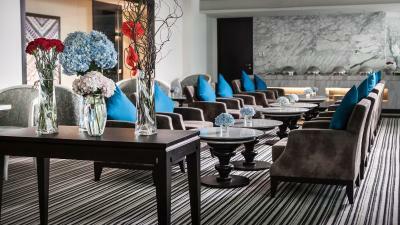 The hotel features over 300 sqm of meeting facilities and laundry services are also provided. Drivers enjoy free parking. 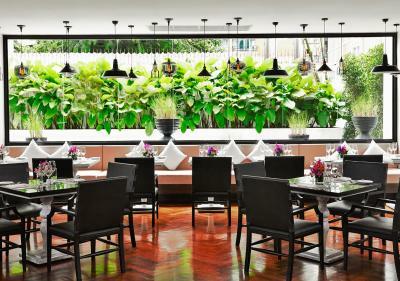 The on-site restaurant, Lelawadee, is an all-day dining option with Thai and European delicacies, while Rainforest Rooftop Bar serves cocktails with views of Bangkok's skyline. 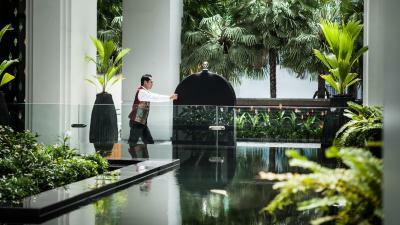 When would you like to stay at Mövenpick Hotel Sukhumvit 15 Bangkok? Featuring contemporary Thai-style decorations, this superior room offers a flat-screen TV and a mini-bar. A walk-in rain shower is included in an private bathroom. Guests staying in this room benefit from complimentary chocolate hour daily between 16:00 and 17:00 hrs. 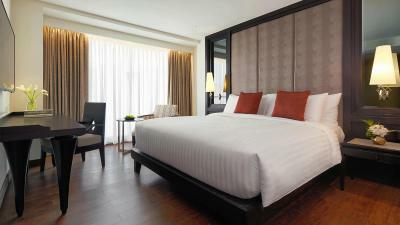 Located on the higher floor, this deluxe room comes with a flat-screen TV and a mini-bar. An private bathroom includes a walk-in rain shower and a bathtub. Guests staying in this room benefit from complimentary chocolate hour daily between 16:00 and 17:00 hrs. Set on the highest floor, this executive room comes with a flat-screen TV, a mini-bar all together with an espresso maker. 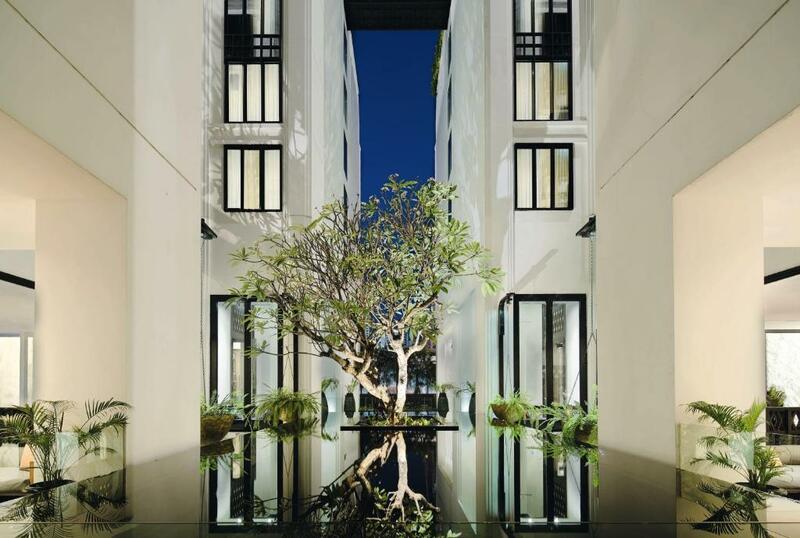 An private bathroom includes a walk-in rain shower, a bathtub and Mövenpick-brand toiletries. Set on the highest floor with panoramic city skyline views, this spacious suite comes with a separate living room equipped with a flat-screen TV and a kitchenette with an espresso maker. 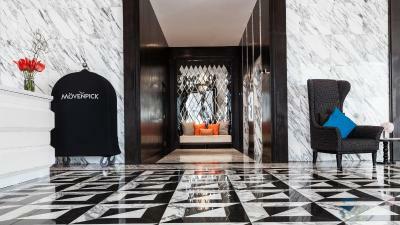 An private bathroom includes a walk-in rain shower, a bathtub and Mövenpick-brand toiletries. 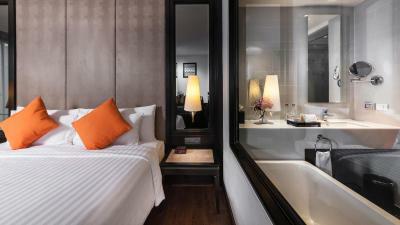 This deluxe room offers a flat-screen TV and a mini-bar. A walk-in rain shower and a bathtub are included in an private bathroom. Guests staying in this room benefit from complimentary chocolate hour daily between 16:00 and 17:00 hrs. 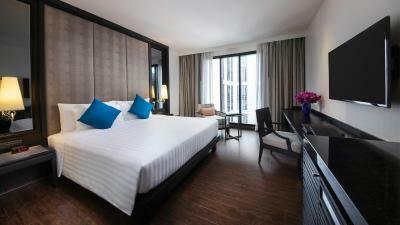 The Mövenpick's family rooms are perfect for families, featuring a flat-screen TV and a mini-bar. A walk-in rain shower and a bathtub are included in an private bathroom. Guests staying in this room benefit from complimentary chocolate hour daily between 16:00 and 17:00 hrs. Set on the highest floor, this room comes with a flat-screen TV, a mini-bar all together with an espresso maker. 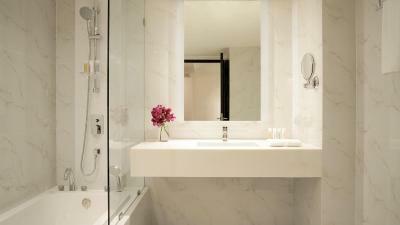 An private bathroom includes a walk-in rain shower, a bathtub and Mövenpick-brand toiletries. This classic king room comes with a working desk, a 46-inch flat-screen LED TV, mini-bar, laptop-size safe and complimentary WiFi. The private bathroom features a walk-in rain shower. This classic twin room comes with a working desk, a 46-inch flat-screen LED TV, mini-bar, laptop-size safe and complimentary WiFi. The private bathroom features a walk-in rain shower. Located in the new wing, this junior suite features a separate living room with a 46-inch flat-screen LED TV, pantry and an espresso maker. The bathroom comes with a bathtub and shower facilities. 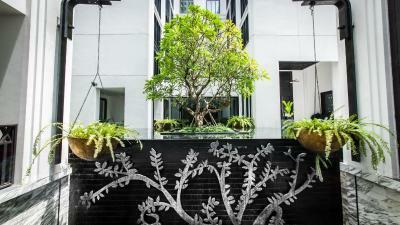 House Rules Mövenpick Hotel Sukhumvit 15 Bangkok takes special requests – add in the next step! 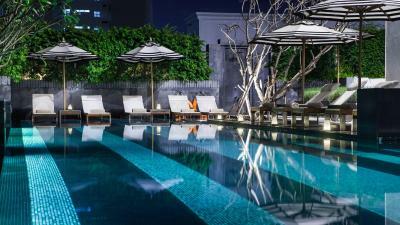 Mövenpick Hotel Sukhumvit 15 Bangkok accepts these cards and reserves the right to temporarily hold an amount prior to arrival. 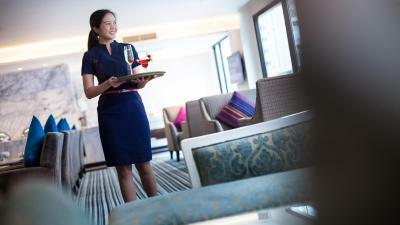 Guests are required to show a photo identification and the same credit card used for booking upon check-in. Please note that all Special Requests are subject to availability and additional charges may apply. Could do with a regular check on cleaning to detail. It was very clean everywhere and well cared for. Lovely building and easy access. All staff are very friendly and helpful 5 * service. 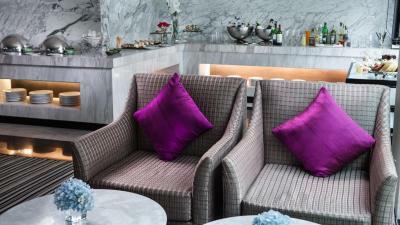 We booked with executive lounge access and the overal ambiance is super relaxed and friendly. the room is considerably small, but understandable. overall, we like the service and the facilities. the free shuttle to Terminal 21 is truly a huge plus. The service was great, everyone was attentive, the room was comfy and clean. Breakfast was good and private. 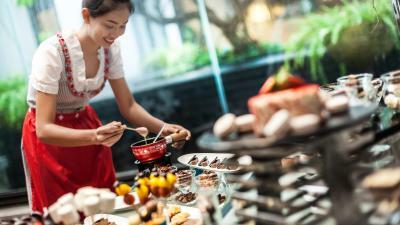 Room Service menu could have more light lunch options. 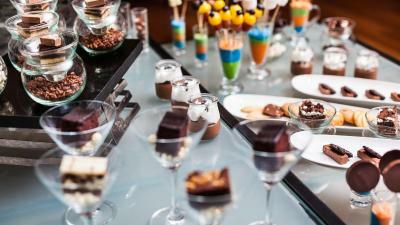 There are no words to describe our experience at Movenpick. It was all super amazing, room, food, hospitality. A big thanks to Cha, Pia and Martin who looked after us all the time that we stayed there. We didn't feel it warranted a 5* rating. 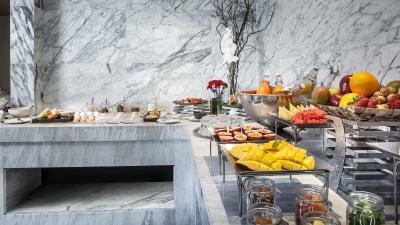 The room was adequate and no more, the lounge was ok but selection at breakfast was poor in both lounge and restaurant - a 5* hotel needs to offer a much bigger range of fruit than melon and pineapple (can't even compare with Lebua, Banyan Tree, Radisson Blu, Marriott Marquis or Hilton). 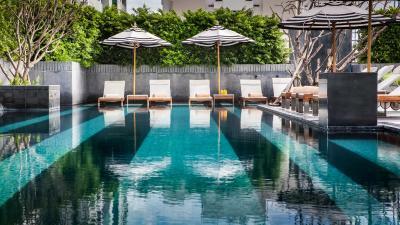 The roof area and pool are disappointing and not as good as 4* hotels including the Mercure on Soi 11. Service was ok, sparkling wine in the lounge was good. 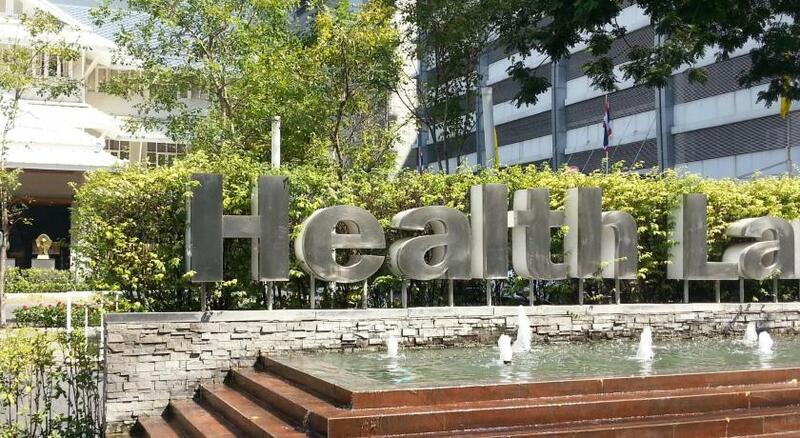 Location is ok walking distance to Sukhimvit road and the more lively soi 11.